Corn Pones are also referred to as “hoecakes” or “Johnnycakes.” The Native Americans made them with just corn meal and water and ate it as their daily bread. Stir together the cornmeal, baking powder and salt. Add the bacon drippings and milk. Stir well. 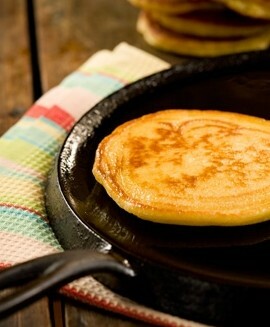 Making about 4 pones (flattened circles) for each bowl of batter, plop the batter onto a greased cast iron skillet. Cook until golden brown on each side, flipping once. To present them in a unique, but truly Indian style, make corn pone this way as the Sioux sometimes did. Form into small rolls and wrap in green corn husks. Bake at 350 degrees for 30 to 45 minutes. Check one to make sure they’re done and then bring the rest in the corn husks and serve with jam, butter or honey.